Posted April 27th, 2012 by Nancy & filed under Uncategorized. Our compliments to all the Skins3.0 participants! Our 4th session is wrapped up and already a lot of progress has been made. We opened today with reviewing the paper prototype and filling in the few details that remained so that the programmers can begin fleshing out the map grid. A couple of key design decisions were settled, including placing the 2nd village at the highest point on the edge of a rocky cliff (in the style of Edinburgh Castle). However, since this village is in ruins, half of it has crumbled into the water below. This is a striking detail that will add some definition to both the story and the landscape. Another important step forward was naming both the newly merged game AND the two villages. Seeing as the Skins1.0 production was titled “Otsi:! Rise of the Kanien’kehá:ka Legends” and the Skins2.0 game was “The Adventures of Skahion:hati: The Legend of the Stone Giant”, the participants of Skins3.0 appropriately titled their collaborative work “Skahion:hati: Rise of the Kanien’kehá:ka Legends”. After settling on that title, the team did some research into past Mohawk villages and what their naming conventions were. We found two existing sites that had perfect names for our two fictional, neighboring villages. Skahion:hati’s original village where he heads off to fight the stone giant is now named Osquake, which translates to “under the rock”, the old village which has been terrorized and destroyed by the giant head is now called Onoalagona, which means “Big Head”, and the waterfall area where the battle with the stone giant takes place has been nicknamed Ohneka, meaning “water”. Before getting into the technical animation lesson, everyone showed what they had made over the break and committed their files to SVN. We now have a rattle added to our list of 3D assets, made by Lisa, a club added by Lance, a beautiful intro animation by Towanna, more longhouse details by Nather and an update script by Tathe. Seeing as everyone seemed to have a good handle on 3D modeling and texturing, we moved on to animation. 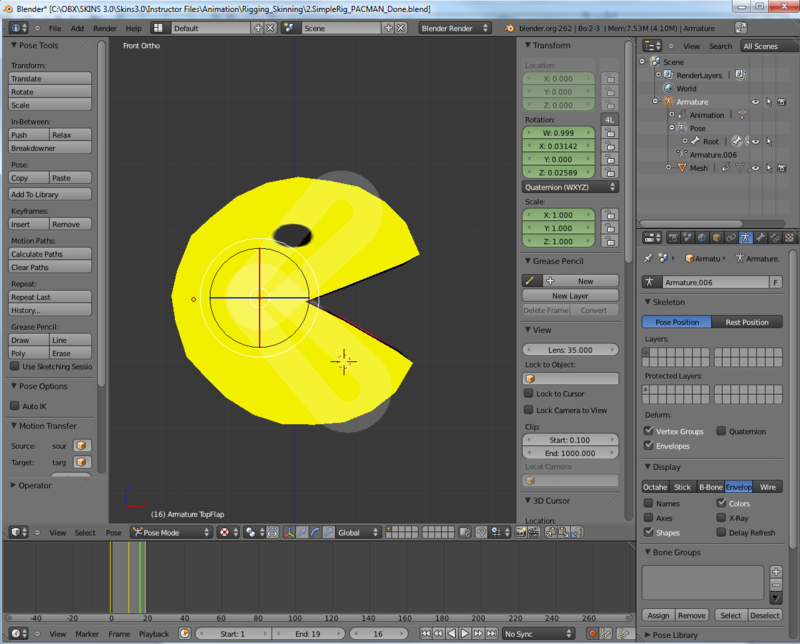 The lesson began with learning to move an object (in this case, it was a 3D model of Pacman) using keyframes to animate its basic attributes of location, rotation and scale. Next, the students learned how to build a basic armature (or rig) for a simple object in order to animate the mesh bending – as an example, we all made a skeleton for our 3D Pacman so that he can do his trademark mouth opening and closing. Last but not least, we set up a proper, full rig that was relatively simple to create using the plug-in “Rigify” that comes packaged with Blender. Almost instantly, any biped model can have a beautiful, easy to use rig applied to it with little hassle, though some skinning may have to be adjusted. The homework for this week was, as always, to push forward with production! – Tathe & Towanna will continue to refine their script so that we can officially book voice actors and recording time. Do not forget to include in-map lines and battle exclamations! – Nather & Lance will continue on various models for the game, as we will be beginning Unity next week! As always, remember to take Jing screenshots for documentation and/or errors. You can always contact us via the google group email if there are any questions.